Solid-state NMR techniques are used to study molecules or biological systems with little or no mobility, and thus pertain to situations where the CSA and dipolar interactions are not completely averaged out from rapid, isotopic tumbling. To increase chemical shift resolution, samples are often spun under conditions of the “magic angle” to reduce or eliminate CSA and dipolar effects. Despite the challenges of studying biomolecules with limited motion, the popularity of solid-state NMR to study biological systems has grown significantly over the last decade. 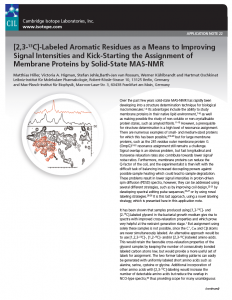 This increase is due to advances in probe and magnet design, pulse sequences, isotopic labeling strategies and solid-state NMR’s unique ability to obtain structural details on medically important samples such as membrane proteins and protein fibrils. Sample types now include whole cells and microcrystalline protein. Although there is no limit to the molecule weight of the compound being studied, limitations to size often correspond to the amount of spectral crowding that can be tolerated. Spectral simplification is achieved with selective amino acid-type labeling and one-bond 13C-13C dipolar couplings can be reduced using sparse 13C labeling. Partial protonation may also be used to enhance 13C resolution and sensitivity at high MAS speeds and for low-temperature DNP methods. All related products can be found in our Structural Isotopes for Biomolecuar NMR catlogue listed below. If you have any questions about these products or would like to discuss your needs then please don’t hesitate to contact us.